Today I'm going to explain a recipe that I found in a grocery store magazine. This was hands down the first time I was trying to follow a recipe without changing it [if you forget a toping and an additing of ingrediants part]. The funny part is that the recipe wasn't correct, it was way to much and it wasn't even a soup since the noodles absobered all the water. And they also told me to put a whole bush of bok choy in the soup. Doesn't look like the picture at all, sadface. To start off is to boil the eggs for around 8 minutes. While boiling the eggs you can cut the onions, garlic and bok choy. Add the oil, onion rings, garlic and sambal. The sambal will set the begin taste for the soup. Cook till the onions look nice but not brown and feel soft. Now or take a new pan, because you need to add 1,5 liters of boiling water, or if you have a high frying pan like me you can just pour the water in with the oil, onions, garlic and sambal. Now add the 2 vegetable tablets and the bok choy. 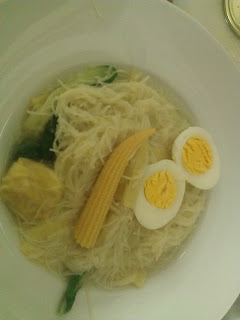 Wait a minute and than also add the noodles. Make sure that you do this on a low fire, because if you have the same noodles as I had you will not end up with soup. 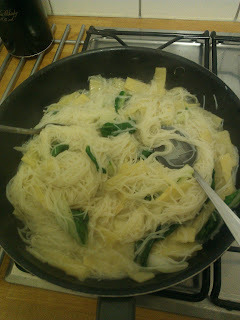 Now add some extra water, the wan tan and the bamboo shoots. Let it kind of boil for some minutes while you cut the eggs in half. Íf you're done with the eggs than turn off the fire and scoop the wan tans out. 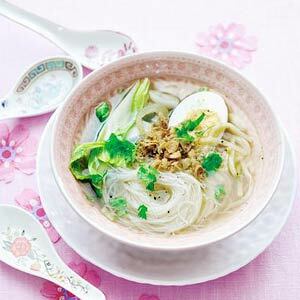 Now put the noodles and bok choy and everything in a bowl [for soup]. Add some extra water if needed and as toppings the wan tan the 2 halfs of the egg and the mini corn. and if you try it let me know!